Octopus’ Garden is the newest release from Valley Games and the first design by Roberta Taylor. Roberta was the first ever winner of the Canadian Game Design of the Year Award in 2010. Her design caught our eye and after we played it, we knew we had a winner. 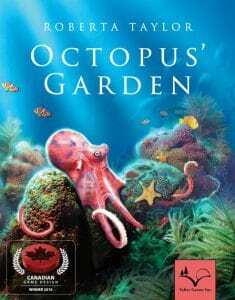 In Octopus’ Garden, players take the role of Octopuses competing to create the most beautiful gardens. Attract colourful seahorses and clown fish, without losing pearl-producing oysters to the hungry sea stars! Octopus’ Garden is a tile laying game for 2 to 4 players aged 10 and up, and is played in under 45 minutes.